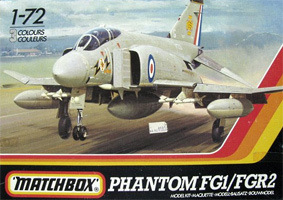 A brief rundown of the various model kits available of the British versions of the Phantom. 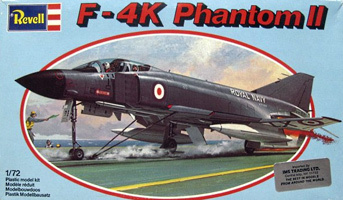 There appear to be no Spey engined Phantom model kits available in 1/144 or smaller scales. 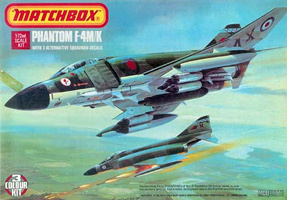 The undisputed king of the British Phantom in this scale is the Fujimi kit. It features finely recessed panel lines, pretty good detail, good quality decals and captures most of the nuances of the F-4K/M airframe perfectly. The canopy is supplied both as a single piece 'closed' example and a four piece version so you can pose the canopies open. Vinyl wheels are supplied though most modellers choose to use the plastic versions. It has been released in a bewildering number of boxes with varying decals and each boxing usually correctly represents the particular airframes covered (e.g. with slotted stabilators or not, and different tail fins - with RWR or without). There are a few minor problems - the original release has the fuselage side auxiliary intake doors in the wrong place, and the belly aux intake doors can't be modelled open (both issues fixed in the later releases). The main intakes do not include trunking and end at a blank wall with no representation of the engine compressor face. The Sidewinders included are AIM-9Es which British Phantoms did not use. The cockpit is a little disappointing, with pretty decals providing generic detail. All these are really pretty minor issues though. There were four kits issued originally (Firebirds, Shark Teeth, Silver Jubilee and Yellow Bird, all with a black band along the bottom of the box art), then two special editions with some white metal and etched brass parts to improve the cockpit - 25th Anniversary (raspberry ripple, with one of the options having the unusual radome fitted to the jet in question) and Alcock & Browne), then four re-issues of the original releases (same decals, new box art and various upgrades to the moulds - e.g. seperate flaps, corrected auxiliary inlet doors, better detailing on the jet pipes and so on). Those were followed by three limited editions, all using the upgraded moulds and new decals (Black Mike, Bye Bye Blue, Treble One). Most recently there have been re-issues of the Alcock & Browne and 25th Anniversary kits (but no metal parts this time, and mistakenly includes FG.1 nose gear and catapult attachment points). The upgraded mould kits are obviously worth seeking out over the earlier releases but this is not to say you shouldn't pass up the opportunity to get any boxing, as the basic kit is excellent regardless of the improvements made to the later releases. Availability in the UK is patchy but Models for Sale and Relish Models have both had limited numbers for sale in recent years and they come up fairly steadily on eBay as second hand items. They can also be ordered from Japan for around the same price delivered. GARNS4001: XT872 of 892 NAS, HMS Ark Royal in standard EDSG/White scheme with 1977 Silver Jubilee markings. Generally looks the part but there are lots of small errors in the paintjob - roundels too big and in the wrong places, underwing serial in too thick a font, lots of missing stencils (and those that are there are almost without exception wrongly placed or sized), camo demarcation wrong under intakes and nose, tail Omega marking wrong size. Comes with a gun pod and FG.1s didn't carry them! Bright yellow ejection seat head box - what were they thinking? GARAF4002: XV497 of 23 Squadron/1435 Flight in an attempt at the air defence grey scheme. A ModelZone exclusive. Sadly a bit of a disaster. Pitots missing from fin. Wrong Sidewinders. Rescue arrows missing. Roundels wrong colour, size and position. Radome, inner wing topsurfaces, undercarriage bays, gun pod, pylons and underside by exhausts are all the wrong colour. GARNS4003: XT864 of 892 NAS, HMS Ark Royal in her 'FLY NAVY' final flight colours. Most of the same faults as GARNS4001 though the ejection seats are no longer yellow. GARAF4004: XV567 of 43 Squadron in grey/green. Wing roundels in the wrong places but otherwise a good effort. GARAF4005: XV498 of 92 Squadron in another attempt at the air defence grey scheme. Inner wing top surfaces still the wrong colour; but the flaps are right - which looks worse than leaving them in the wrong colour too. If you can overlook the faults, they don't look so bad sat on the shelf - with the exception of the Modelzone special, which is just awful. Not one of Matchbox's best efforts, this. 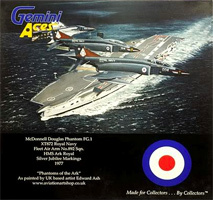 Released twice by Matchbox in different boxes with different marking options, it has since been reboxed by Revell too so is quite easy to get hold of. Alas, there's no real point in getting one - it has typically deep Matchbox recessed panel lines and is devoid of any detail in the areas of jetpipes, undercarriage and cockpit. The canopies cannot be shown open; Matchbox moulded the solid parts of them as part of the fuselage, then also moulded a line on the clear canopies. The result is most paint that bit and make the canopies look squashed; if you sand them down and then polish them back to clarity they don't look so bad but must be built closed. They are still a little too squashed looking though - the windscreen in particular. Stores supplied are possibly the worst Sidewinders ever produced in injection moulded plastic (with similarly poor quality pylons), drop tanks, belly tank, gun pod, recce pod and rocket pods. The nose radome is too large compared to the fuselage so needs a humungous sanding session to get it to match up; however as it's already deformed in shape, you're better off throwing it in the bin and sourcing a replacement. So, lots of work to get a good looking Phantom, and you need to buy some third party decals anyway. This is not an F-4K/M, but is just an ancient reboxed F-4B with decals to cover British schemes. Avoid like the plague. This is also not an F-4K/M, but is once again an ancient reboxed F-4B with decals to cover British schemes. Avoid - you guessed it - like the plague. Not a new kit, but a reboxing of the Hasegawa 1/48 Phantom, which is no bad thing as it's a superb kit. Back in 2007 these were being dumped at about a tenner each, which was a real steal. The decals are far superior to those in the Hasegawa releases. On the negative side, none of the 'high grade' metal parts are included, and this includes the wheels, leaving only the inaccurate plastic wheels. Otherwise, all the comments on the Hasegawa kit below apply. Sadly they are now out of production once more and becoming difficult to find, particularly at a reasonable price - some sellers attempting to get rid of theirs at prices similar to buying one of the Hasegawa releases at the full current day price. 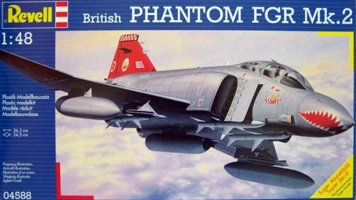 Thankfully Hasegawa's 1/48 effort is actually a model of a British Phantom and not a reboxed American variant! This is an excellent kit, up to Hasegawa's modern day standards with finely recessed panel lines, good detailing and accurate shape. On the negative side the colours of the national markings on the decal sheet are too dark, there are no intake tunnels and the intakes end at a blank wall with no representation of the engine compressor face. Also, no Sidewinders are supplied (though drop tanks, a gun pod and Sparrows are). Parts breakdown is remarkably similar to the Fujimi 1/72 kit, with open aux intake doors, separate flaps, inserts for the catapult hooks and so on. The FG.1 and FGR.2 boxes contain basically the same parts, bar stabilisers which are supplied slotted or not as per the version in question. This was a "High Grade" release and added photo etched brass parts for cockpit details and white metal parts for the undercarriage, refuelling probe and ejector seats. As is common with Hasegawa, they have released numerous boxings with specific paint schemes e.g. 'Black Mike' and 'Tiger Squadron'. The fit of parts is a little off in places, so care - and filler and sanding - is needed with the radome, intakes and wings. Prices have climbed steadily as with all Hasegawa products, and the current ridiculously high price along with inferior decals means it loses a star compared to the Revell release. None available that I know of. There has been one 1/32 resin conversion set, that from Meteor Productions/Wild Hare Association designed to convert the Tamiya 1/48 F-4J, but that was hugely expensive (~£275 back in 2008), produced in limited numbers (supposedly around 80), and the manufacturer folded in the middle of production after a death spiral of increasingly erratic online behaviour. Many who ordered had to instigate charge backs on their credit cards so it is highly unlikely that the full 80 sets were produced. Naturally with the original price being so high and the limited run, your chances of finding one for less than the price of a small car are minimal. You'll no doubt feel better if I mention that the reheat nozzles are overly simplified and the intake interiors are shaped wrongly. The initially impressive decal selection is lacking most of the stencils applied to British Phantoms - and that's a lot of stencils!